NOTE: Please select required Current Range & Communications protocol variant from the Recommended products section at the base of this page. It's always difficult but crucial to figure out how much energy is being consumed. The PM-313x series is a powerful, cost-effective, advanced range of Compact Power Meters. With its high accuracy (0.5%, PF=1), the PM-313x series products can be applied both on low voltage primary side and/or medium/high voltage secondary side and enable the users to obtain in real time the reliable and accurate energy consumption readings from the monitored equipment. These compact sized and cost effective Power Meters are equipped with revolutionary wired clip-on CT (various types support input current up to 400A) and standard RS485 Modbus communication protocol for easy deployment. It works with input voltages ranging 10V ~ 500V, supporting a wide range of applications. The PM-313X family comes in a full range of Single-phase and Three-phase compact power meters for power monitoring. The products offer a rich feature set combined with easy-to-integrate communications. They can easily be combined with our Data Logging and Data Acquisition products for a complete solution, such as our Orchestrator SCADA software, GT-540 GPRS Remote Logging unit or the PMC/PMD series of Power Meter Logging units. The PM-313x series also come with 2 channels of relay outputs, which can be linked with sirens or lights for alarm indication. 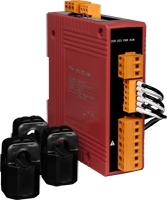 It supports Modbus RTU protocol (with Modbus TCP or CAN bus) for easy integration. Use PMC/PMD Series Power Meter Concentrator/Logging unit (record data from up to 24 Meters), with integrated web Server. Compact Three Phase Smart Power Meter, ModbusTCP protocol. 60A CT's. Compact Three Phase Smart Power Meter, ModbusTCP protocol. 100A CT's. Compact Three Phase Smart Power Meter, CAN/CANopen protocol. 200A CT's. Compact Three Phase Smart Power Meter, ModbusTCP protocol. 200A CT's. Compact Three Phase Smart Power Meter, ModbusRTU protocol. 400A CT's. Compact Three Phase Smart Power Meter, ModbusTCP protocol. 400A CT's.